It’s officially September – which means lots of things! First, summer vacation is over. School starts next week, and I must go back to work. This year I’ll be teaching intermediate again, although it has yet to be decided if it is a grade four or five class, or both! While I love the summer, I’m always happy to get back into the routine of things come September. This summer we went on our honeymoon, which was absolutely amazing. We went to Europe for three weeks, visiting Paris, Barcelona, Santorini, Mykonos and ended in Rome. It was such an awesome unforgettable holiday. Secondly, September is special because next week we will celebrate our one year anniversary! We were married last September the fifth. You may remember that I baked and made our wedding cake myself. After looking at what I had wanted, and realizing how expensive it would be to have it made and how silly and simple it really was I decided to just do it myself (as usual). I had wanted something simple, and of course, delicious. While I’m a huge fan of peanut butter (all nut butters, for a matter of fact), Adam is actually not a big fan. He’ll eat peanut butter and jelly sandwiches, but when it comes to plain ol’ peanut butter – well, let’s just say he wouldn’t dive spoon first into a container the same way I would. However, when you put peanut butter and jam together, he’s happy. So when I had hinted at the possibility of making a peanut butter and jelly wedding cake, he was on board. Since I made ours, I didn’t actually freeze any of it. I figured, I could re-create it and bonus – no freezer burn! 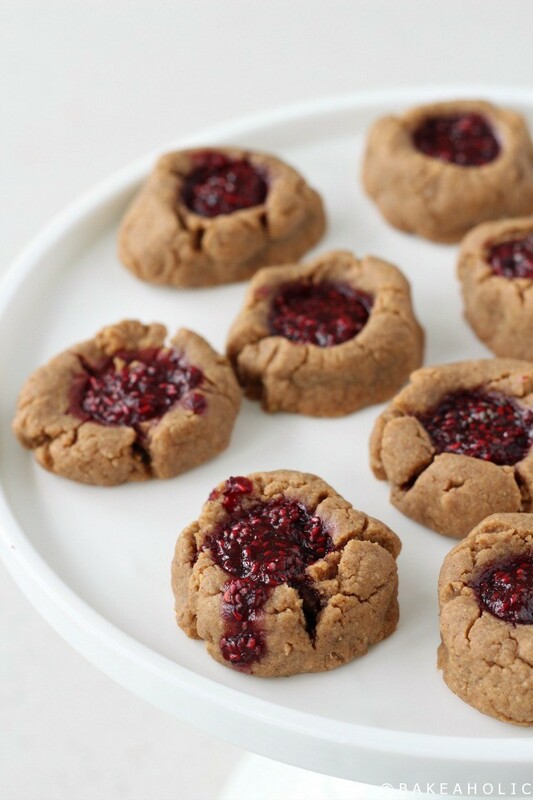 While I was at it, I couldn’t help but think of peanut butter and jelly cookies. The epitome of back-to-school for me is the classic sandwich. Although, now with so many food allergies peanut butter is not allowed at school. So I have to leave my beloved (peanut butter, that is) at home for an after-work treat. 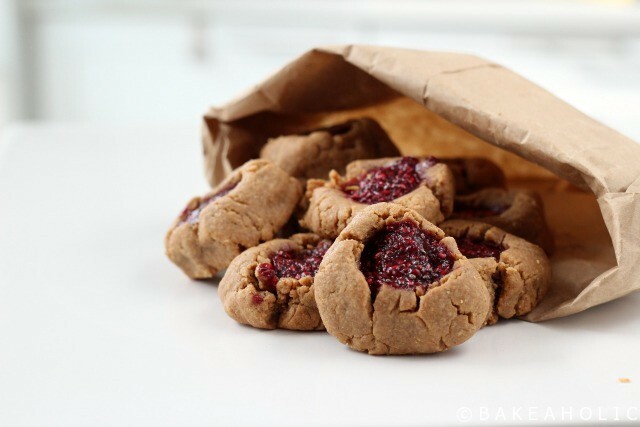 A wheat-free soft peanut butter cookie baked with two-ingredient raspberry jam. Perfect for an after school treat. Preheat oven to 350F and prepare pan with baking sheet. In a large bowl combine peanut butter, egg, coconut sugar, and oat-flour. Stir until well combined and dough forms. Place bowl in the fridge to chill,10-15 minutes. 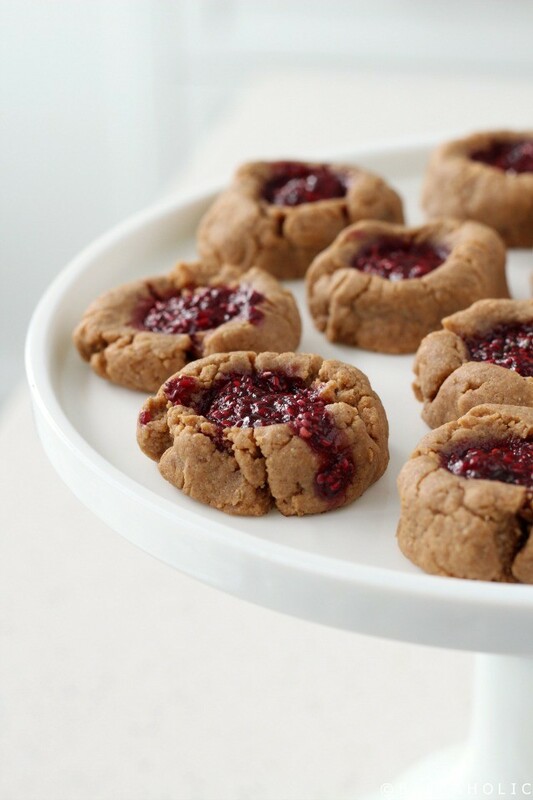 While dough is chilling, make the Jam. To make the jam, microwave raspberries in microwave-safe dish for 2-3 minutes until simmering. Remove, and and in the chia seeds stirring to set. Remove dough from fridge, using a small piece of dough at a time and roll into 1-2 inch balls. Place on the cookie sheet. 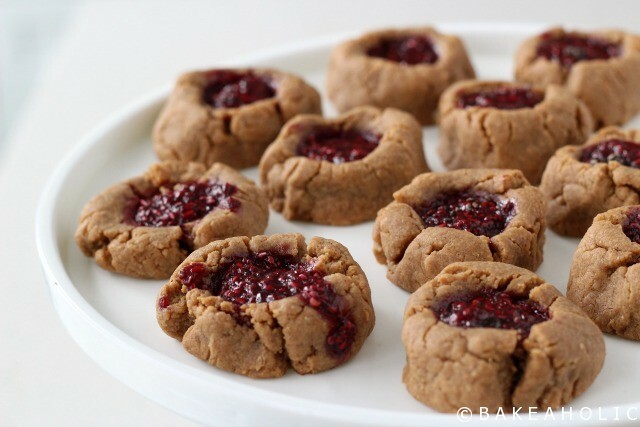 Make a small indent with your thumb in each ball of cookie dough, then add a spoonful of jam in the center. Place in the oven and bake for 12 minutes. Can be stored on the counter or frozen. 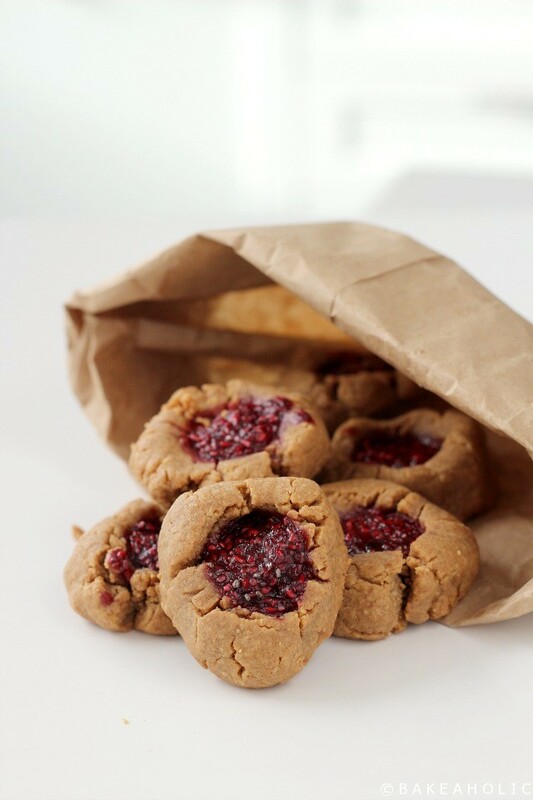 To make oat flour, simply pulse 1/2 cup gluten-free oats in blender or food processor until fine flour forms.